The Graduation Bung (“bung” is the pidgin word for “meeting”) was a wonderful blessing! The food was plenteous, the weather perfect. Because of the way and distances people travel here, the graduation was not a “two hour program” but a weekend long meeting. You can’t have someone paddle 6 hours, or spend $200 in fuel and then send them right back home after a morning program. Saturday’s graduation exercises and feast were attended by well over 200. We had done a lot of practice, but I still must admit, I was pleasantly surprised all nine graduates remembered “where to be” and “what to do” during the exercises with all the excitement! Most people returned for the Saturday evening’s preaching, done by Pastor Yak from Kikori. 154 of us were staying on the grounds here, people from 5 other Baptist churches joining us, along with some unsaved family members of students, and our TTMK director, Matt Allen. Except for Pastor Matt’s preaching in the Sunday morning service, the day’s preaching and teaching times were done by the graduates. One young man was saved before the Sunday School! Student Maisa’s brother was saved following the morning service! Following the two evening preachers, two young women and Student Ricky’s parents were saved!! 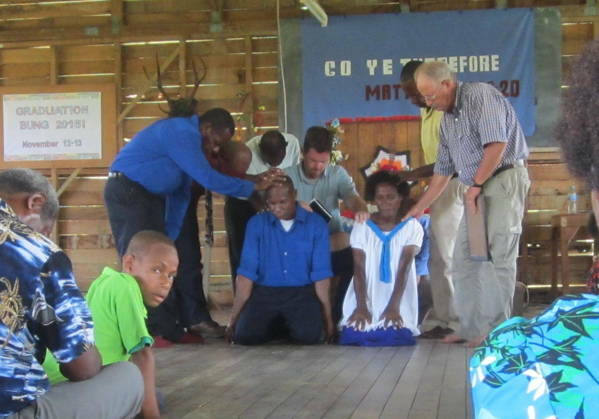 Another sweet highlight from Sunday was the ordination of graduate Murphy Hukorape. 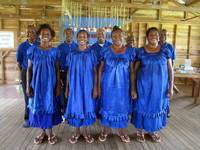 Murphy and his family will be ministering in the village of Harevavo, among the Orokolo. This village is one of 5 large villages right along the Gulf of Papua. There are a group of believers awaiting their pastor, but currently no place to meet. Maisa and his family will also be ministering among the Orokolo, but inland, in the village of Huruta. Maisa’s sending church in Port Moresby is planning to ordain him in the near future. Liberty Baptist Church of Huruta is an established work, and they are looking forward greatly to having a trained man in the pulpit, and sending another family our way for schooling. Graduates Richard and Ricky both believe God would have them work in areas without a plain gospel witness and good Bible teaching. Richard is praying about Kinipo, a Baimuru village, and Ricky feels God would have him go to Ihu Station, among the Orokolo. These are both places we are burdened for, and we are excited about the possibilities of these works. These two men will be staying here in Baimuru Station until Trina and I return from a supply run, and a hearing check-up. In January we will work with them, getting them settled in new locations. God is choosing to make the next year a “surprise” for us. 2017? Right now, we are planning like we will have a classroom full of students, although we only have an application from one couple at this point! God is choosing to make the next year a “surprise” for us. There have been a number of people “interested”, but that is not the same as moving you and your family from your village and trusting God to meet your needs in a new place. Many have had little formal schooling, especially the wives, and this frightens them too. Pray for God’s will in this. Perhaps He knows that we will need to give more time to helping the recent graduates, and do more traveling in the dinghy. Please click for a printable version of this newsletter.